The following is an explanation of Police Radar. It explains Police radar and it's operation and theory - from the h2g2 web site ran by the BBC. You're driving down the highway, and you're passed by a little red sports car. Two miles down the road, you see blue lights on a car parked just behind the red car. Have you wondered how the officer knew how fast they were going? How does the police radar work? Is there anything that I can do to avoid police radar? Police radar is a doppler radar. It measures speed by looking for a red shift or blue shift in light, similar to the way astronomers measure the velocity and and distance of stars. The radar antenna emits a beam of light in the radio frequency range. The light bounces off of the target, and then returns to the police radar antenna. The velocity of the target will change the frequency of the radar signal. That change in frequency is interpreted by the radar unit and shown to the officer as the target's speed. It's often helpful for the officer to include other information such as weather and traffic conditions, and any statements made by the violator. On 30 December 2001 at about 8:27pm, I was operating stationary radar on Highway 1 near Main Street, in the city of Centre, Georgia. The area is posted as 45 mile per hour zone. I noticed a red Saturn SL1 traveling east on Highway 1 at a high rate of speed. I activated my radar. It gave a high-pitched clear tone, and it indicated a speed of 62 miles per hour. I stopped the Saturn and made contact with the driver, Ms. Blank. Some jurisdictions may require additional information, such as the calibration information on the radar, the officer's certification to operate the radar, information establishing why the violator's speed was unsafe, etc. The most important part of a radar case is a tracking history. The radar unit will display a number, and that's all. It doesn't tell the officer which vehicle it is, or if there's even a vehicle there. The officer has to track the vehicle to make sure that his observations match what the radar is showing him. Otherwise, the officer might stop the wrong vehicle or a common radar error might give an incorrect speed. In some jurisdictions, the officer has to visually estimate the violator's speed within 5 miles per hour. This is generally referred to as biggest, closest, fastest. The radar usually picks up target that is the largest in its view. Therefore, it might pick up a motorcycle that was very close to it before a tractor-trailer a mile down the road. Many times the radar will display different speeds of different vehicles that are close together. The officer has to determine if he's getting a good reading, and if so which vehicles' speed is being displayed. This isn't as hard as it might sound. Radars are equipped with a speaker which give a tone reflecting the doppler signal its receiving. If it's a clear high pitched tone, then it's getting a good solid reading from a vehicle. It will give a low raspy tone if it's not getting a clear signal. This happens when there's something in between the radar and the target or when the vehicle is entering or leaving the beam. Once you have a solid tone, you look at how the traffic is moving. If there is a clump of vehicles that is moving at 65mph then a vehicle overtakes them at a high rate of speed, and the radar shows 85mph, it's easy to figure out who was going that fast. Alternatively, if a group of vehicles is traveling together in a clump, where no one is overtaking or falling behind, all the vehicles in that clump will be at about the same speed. Some radars have a fastest vehicle button that will display the fastest vehicle in its cone. This is very useful for when there are large targets such as tractor-trailers in between the radar and a fast moving small vehicle. Stationary radar is radar at its simplest. The officer sits on the side of the road, and watches traffic. When he observes a vehicle moving at high speed, he activates the radar. The radar goes through its basic decision factors (Reflectivity, Position, and Speed) then it displays that speed. The radar will give a tone. If the tone is clear and the displayed speed matches the officer observations, the officer can make the stop. Moving radar is very similar stationary radar, but it's looking for two different speeds. The radar looks for the largest object in its field, and it assumes that this is the passing background. Then it looks for the second most significant object that it assumes is the target. The radar actually measures the closing speed or separation speed between the target and the patrol vehicle. The radar's counting unit will then use the following formulas. The radar unit will then display two speeds. It will show the target speed and the patrol speed. The officer must compare the patrol speed displayed on the radar with that displayed on the car's speedometer. This is an essential element of the radar case. The radar speed will be more accurate, but there are certain errors that this will detect. The speeds must be consistent. Same direction radar was developed when engineers were examining the shadowing error. Same direction radar uses very different logic than moving or stationary radar. It also requires more a complicated tracking history. Basically, it figures out the patrol speed. Then it looks for the bounced reflection off of the other vehicle and measures the relative speed between them. This makes things more complicated because the officer must decide to activate the radar, let the radar know if the officer or the target is moving faster. There are several things that will affect a police radar unit. There's a famous example of a lawyer aiming a radar at the courtroom wall and clocking it at 19 miles per hour. Radars will pick up interference from things other than vehicles. Power lines and the patrol car's air conditioner are the most common things that a radar will register. This is why training and experience is important. Officers will learn where the power lines are, and how the radar will react to them. Police radar uses part of the electromagnetic spectrum. They can be influenced by any number of electromagnetic and physical phenomena. For instance, targeting radars on fighters use the same frequencies. Air conditioning units in patrol cars can create a reading (generally 32 mph). Some high power lines can also set off radars (generally in the around either 92 mph or 101 mph). Officers must have a good tracking history in order to confirm that his observations are matched by the speed displayed by the radar. If an officer is traveling along a road with a 35 mph limit, and sees a vehicle traveling at around 50 mph, and the radar displays 100 mph, he knows that the result is bogus. An officer should know his beat well enough that he's aware of the common sources of interferences. Some forms of interference, such as the air conditioning units, will disappear when the radar detects an actual moving object. Its decision factors will ignore any signal as weak from the air conditioner unit. Cosine error is when the radar antenna is at an angle to the target. Instead of coming straight towards the antenna, the target is moving across the beam. Some of the speed is lost. Imagine that an officer is sitting at the right angle in the figure to the left. The target is moving at five blocks per minute, but the since light travels in a straight line, it's only measuring the speed along line b. It looses one block per minute of speed. Basically, this means that if an officer is sitting at an angle to the flow of traffic, the speed indicated will always be lower than the actual speed of the target. In stationary mode, it's always to the advantage of the violator. In moving mode, a cosine error can reduce the computed speed of the patrol vehicle. So when the counting unit computes the target speed with CS-PS=TS, the target speed will be higher than it should be. To counteract this, the officer needs to check his speedometer against patrol speed displayed by the radar. Masking is a rarely observed error where the radar antenna is pointed at the counting unit (the part of the radar that shows the speed). Shadowing is when an officer is behind another moving object. Usually it will be something large like a tractor-trailer. The radar will interpret the tractor-trailer as the background instead of the actual background. Therefore, when an officer is running moving radar, he has to check the patrol speed showed by the radar unit against his speedometer. If they don't match then he may have a shadowing error. Batching is when an officer is accelerating and activates the radar. Most modern radars have internal error checking that prevent this from being an issue. Scanning is when you swing a radar antenna across a background. It's possible to get the radar to show a speed this way, but it is hard. An officer must be trained to operate the radar. It doesn't take much to figure out how the radar works, but it does take some training and experience. In many states, the officer will have to be licensed to operate the radar. It will be an element of the case that the officer will make in court. Asking the officer for this permit on the side of the road is probably a waste of time. On some occasions, officers will act in teams. One officer will operate the speed detection equipment, and another officer will issue citations. This is particularly common when the police use airplanes to find speeders. In order to obtain a conviction, the officer who identifies the violation must be in court to identify the violation. The officer who issues the citation must come to court to identify the driver. The officers must also be able to say how they were to pass the information about the violation between them. A radar detector is just a radio receiver that flashes a light and makes a noise whenever it receives a signal in a certain frequency range. That's very useful right? The answer is maybe. Just as there are numerous things that a radar picks up as interference, there are a number of things that will activate a radar detector. Furthermore, most police radars are equipped with an instant on feature. The officer will activate a radar whenever he identifies a potential speeder. Therefore, there may be no signal for the detector to pick up until it's too late. That's not to say that radar detectors don't have value. If you're traveling across level ground, then you may pick up the radar signal when the officer checks a driver in front of you. A light check. The officer presses a button on the radar, and all the LED lights light up. An internal circuit check, which is accomplished by pressing a button on the radar unit. Tuning fork check. Tuning forks that are tuned to vibrate at a certain frequency are put in front of the radar antenna. The radar unit will display a certain speed. If the radar doesn't perform within the manufacturer’s specifications, it has to be removed from service until the radar can be repaired. 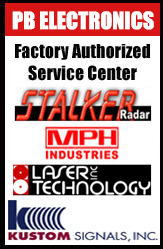 Radars also have to be calibrated by specially trained technicians occasionally, usually once a year. There are other methods to detect speed. The most common are LIDAR (Laser) and pacing. One of the most accurate and easy to use technologies is Laser (LIDAR). A laser is similar to a radar, but it is aimed like a rifle. The officer can specify a particular vehicle whose speed the officer wants to determine. The officer just aims it, pulls the trigger, and the unit displays the speed and distance to the target. Some newer models also take a digital picture of the target. Officers can also pace speeders using their speedometers. The officer maintains a constant distance from the violator. He watches his speed over a certain distance. The violator is then cited with the lowest speed that the officer observed. This method depends on the accuracy of the officer's speedometer. Officers must be able to testify that the accuracy of their speedometer has been checked or use a radar to confirm the officer's speed when following the violator.